From Bach's manuscript - first recording of the B minor Mass according to the "Dresden Parts"
Although the Mass in B minor is one of Johann Sebastian Bach's most frequently performed vocal works, it continues to present performers and scientists with enigmas. 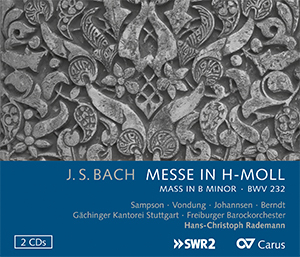 The brilliant new recording under the direction of Hans-Christoph Rademann is based upon the new Carus edition and rigorously follows – in the Kyrie and Gloria – Bach's own meticulously configured "Dresdner Stimmen" (Dresden parts). Thus, for the first time it is based exclusively on the musical text that originated from Johann Sebastian Bach's own pen. This recording is released as a double CD or in a Deluxe version , which includes both the CDs and a DVD with additional material. At least 700 singers are expected to participate in a huge sing-along concert of Mendelssohn Bartholdy's great oratorio Elijah . Many of the singers will learn the music beforehand with the aid of carus music, the choir app. Now you can also benefit from the special price for this app of only EUR 6.99 (instead of EUR 14.99) per voice part, which we are offering on the occasion of this big event. The Liturgy of St. John Chrysostom represents a monumental pinnacle, a return to the roots of early Russian liturgical music. 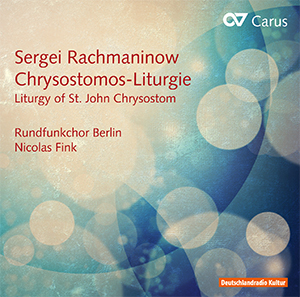 Now available on CD and as sheet music edition from Carus! Mayira Florschütz is enthusiastic about Felix Mendelssohn Bartholdy's Te Deum for eight voices.